Discussions are of course welcome! LOL... now Tom... have you actually read some of the stuff I written?... I am far from even decent at expressing my thoughts. Sometimes my thoughts can be boiled down to either "I don't know why... but I liked it." or "This one blew chunks"
I just do my best to put filler in there to make it look like I know what I am talking about. Well that is ok... I for one will be glad to read your thoughts on anything you watch anyway. Kosuke Fujishima's unforgettable story of every hapless college boy's dream comes to life! Keiichi Morisato is an engineering student, top driver of his campus racing club, and not very lucky with the ladies. While calling for take-out food one evening, a wrong number puts him in contact with the "Goddess Hotline." One misplaced wish later, Keiichi find himself blessed with Belldandy, the perfect girlfriend and a goddess in every sense of the word. Unfortunately, she doesn't have any idea how to act in the human world, and her presence quickly gets Keiichi kicked out of the dorms. Fortunately for Keiichi, his troubles have just begin! Finally I have seen the complete first season of this series (24 episodes + 2 OVAs). I had seen the first few episodes a while ago on YouTube after I had watched the old OVA from 1993 and the Ah My Goddess movie. Then I thought it looked interesting but didn't think it could hold up for a complete 26 episode season. Boy was I wrong. This is a great series, which got better and better with each episode! And the 2 bonus episodes were a great conclusion to this season after the Lord of Terror story arc. I came to love the humor of the series "Adventures of Mini-Goddess" with the meddling of Urd and Skuld which was also true for this series. As a matter of fact, this season has me put again in the mood for anime series (which the last few months was not the case). Probably some of my next reviews will focus on those. For those of you knowing this new series: Is it true, that Gan-chan will appear (maybe in the second season). In the Wikipedia article he is listed as appearing in this series with the same voice actor as in Mini-Goddess. I loved his character in Mini-Goddess. But I couldn't find any evidence at all on the net about this. First I thought it was supposed to be the spirit who transformed himself into a rat early in this first season, but it is a different voice actor. I was couragous and switched to the English dub for a few minutes to see how it is. But I must say: Horrible! Especially Belldandy is totally off. I will continue to stick to the original audio tracks. Monty Python's Flying Circus is a BBC sketch comedy programme from the Monty Python comedy team, and the group's initial claim to fame. The show was noted for its surreal plots, risqué or innuendo-laden humour, sight gags, and sketches without punchlines. It also featured the animations of Terry Gilliam which were often sequenced or merged with live action. Tom if you have read my review on my marathon, you have seen that a bad writer is already here. Don't worry you are certainly much better than me. As my current avatar is a screenshot from this series, I feel I'll have to make a short review for this great series. This is a really funny High School comedy series with hilarious characters. This series covers all three years of a Japanese High School in 26 episodes. After I have seen this anime series, I have read the manga which the series is based upon (my only manga I have read so far, but I am now bidding on the first 26 volumes of Ah My Goddess ). The original manga volumes are a collection of 4-panel comic strips. And the anime captures the feel for it successfully. Almost all jokes from the manga are present and have been transferred perfectly to animated form. This is mainly because they have chosen to do mini-episodes of about 5 minutes length which are cut together to make full 25 minute episodes. If you didn't know this, you may not even notice this, because a common theme is used during such a 25 minute episode. The same goes for the manga strips. They are essentially one-off strips but are continuing small storylines. You can find a few examples of those 4-panel comic strips here. Both the anime series and the manga have something quite seldom about them: You can talk and laugh about scenes with other people without having to first tell what happened before that scene. Here you can find a (in my opinion well-done) fan-made music video using footage from the anime series. Hapless college freshman Morisato Keiichi misdials when ordering take-out and gets an unexpected delivery – Belldandy, a live, honest-to-goodness Goddess! Belldandy grants him a wish, and Keiichi decides that what he really needs is a girlfriend just like Belldandy! And that's exactly what h gets. The mysterious "Ultimate Force" that enforces all Wish Contracts comes into play, and Keiichi and Belldandy are now inseparable. That's when Keiichi remembers that his dorm has a strict rule: NO WOMEN ALLOWED! Can Keiichi and Belldandy find a new place to live? Will anyone buy the story that she's a foreign-exchange student? Does Keiichi have the guts to put the moves on a babe who is LITERALLY divine? And most important, will he be able to survive the "help" he gets from her two meddling sisters, who clearly believe that no mortal is good enough for Belldandy! Find out in "Oh My Goddess!" – the comedy worshipped by anime-fans world-wide! This is a 5-part OVA series from 1993. It successfully condensed the introduction of the main characters to the first three episodes (the new series took for this about half of the season; which is not to say, that that is a bad thing). The last two episodes tell a new story not found in the manga or the new series. Nineteen new episodes classified top secret. Well, not really, they're for anybody who buys a copy of this full season on DVD. 'Corner Gas' continues to save the world one secret weapon at a time, with plenty of exotic spies and evil villains and ... okay, it doesn't have any of that. It's the hilarious crossroads of Dog River, Saskatchewan as you know and love it. It's where pop culture meets crop culture and the bad guys are, well, as funny as the good guys. Whether spring, summer, fall or winter (... okay, it's pretty much never winter, nobody needs to experience that) it's always funny season on 'Corner Gas'. I must admit they got me there with the ending. I never suspected it the entire episode. They had me because I expected a season cliffhanger. Doing the right thing isn't always easy. Just ask Earl Hickey (Jason Lee), a recovering ne'er-do-well with a lifetime's worth of dirty deeds to make up for. In order to turn his life around, Earl needs a G.E.D., a job, an apartment, and a whole lot of good karma. And, if he can keep his ex-wife out of prison, so much the better! Join Earl and his gang of lovable losers as he continues his wildly offbeat transformation from hood to good in the uproarious and outrageous Season Two of 'My Name is Earl'...It's not always politically correct, but it's always hilarious! Another series where I have enjoyed each episode so far! I love the editing style of this series how they interweave all the flashbacks with the story. Starring Jason Lee, known to me mainly from Kevin Smith movies, Jaime Pressly and the great Ethan Suplee. And surprisingly many well-known faces as guest stars like Roseanne, Burt Reynolds, Christian Slater, DJ Qualls. It's great how they can have these stars and it never feels like they are out of place and forced into the story. I also loved the "My Name Is Randy" interludes. I'm currently digging my way through the season one boxset and I am really enjoying it. I love how it's written; it has a real identity of it's own. All the cast and crew seem to follow some form of karma thinking to produce it. I know I'm talking crap, but I know what I mean! 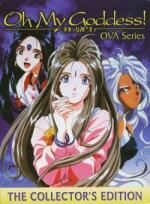 (my only manga I have read so far, but I am now bidding on the first 26 volumes of Ah My Goddess ). I am now curious to see how the manga compares to the TV series adaption. Nikita meets Léon. In this series, terminaly ill or mortally wounded girls are taken in by an government agency under the cover of "Social Welfare Agency". There they get cybernetic implants and are brainwashed ("conditioning"). The main focus of this series is how these girls react to this conditioning and the assignments they get. This series is really well done (both the animation and the story). I have watched this series now twice and I did like it the second time even more. The boxset for this series is about 25$ (3 discs with 13 episodes) and I can really recommend it! This month they start airing a second season to this series in Japan. Sadly it will take at least two or three years until there will be a RC1 boxset release (I usually buy anime only after they are re-released as a boxset and not single volumes). Young-goon is admitted to a mental institution. Believing herself to be a cyborg, she refuses to eat and instead charges herself with a transistor radio. At the institution, she sees a young man playing ping pong wearing a mask. He is II-soon, an off-beat character who has the ability to steal personal and intangible things from people, like habits and characteristics. Young-goon finds all this charming and they become fast friends. Young-goon faints because she refuses to eat, and even become delusional. II-soon is racked with worry and is determined to get her eating again. In style it is similar to Amelié. Chances are, that if you like Amelié you will also enjoy this movie. Like Amelié the main character here lives in a world of her own.